The third molars, which are typically referred to as wisdom teeth, are often very problematic. They are called wisdom teeth because they generally do not erupt in a person’s mouth until they are somewhere between the ages of 16 and 20—meaning they are wiser than when other teeth erupt. Not everyone’s wisdom teeth come in, but when they do, it is often necessary to have them removed. Getting your wisdom teeth removed is a painful process that usually involves several days of recovery. When the teeth are removed, the bone behind them is left bare, which is extremely painful. Your body will build blood clots to cover the exposed bones. Many of the tips we will offer in this post are to ensure that the blood clot does not become dislodged in what is called a “dry socket.” In a typical wisdom tooth removal, the worst pain is within the first twenty-four hours, but if you experience a dry socket, the peak pain will return three-five days after the surgery. Bruising: The most noticeable bruises usually come two to three days after the surgery. These will fade naturally, especially if you stick to the plan and rest. Dry lips: The corners of your mouth can stretch, which will cause them to dry out and hurt. The best way to combat this is making sure that your lips stay moist by using Chapstick. Sore throat: The throat muscles tend to swell, which leads to this. Make sure to keep drinking and this should go away on its own. Stiff jaw: This can often occur, especially if you don’t open your mouth frequently in the few days following the surgery. If you repeatedly open your mouth and stretch out the jaw muscles, this should be gone within a week. You will need to plan ahead for your surgery to ensure that you have several days of recovery time following your surgery. Additionally, you will receive anesthesia during the procedure, so you will need someone to drive you home, and ideally stay with you for the first day at least. With all kinds of ideas circulating about strategies to speed up recovery, here is our advice to help you have a quick recovery without complications. Bite gauze and tea bags: To slow and control the bleeding in your mouth, it is extremely important that you keep some pressure on those areas. For the first twelve or so hours, you should exclusively use gauze. The doctor will apply it first, but you will need to change that one within an hour. You will need to continue to change it to assure that the gauze doesn’t become saturated with blood. You can switch to damp tea bags at some point, as they can minimize pain and encourage blood clotting. Rest: As you rest, you should use pillows to keep your head elevated, which will help reduce the swelling. You should avoid exercise and strenuous activity, as this can cause further swelling and hamper your recovery. During the recovery, make sure you do not stand up too fast, as that can cause you to become light-headed. Eat: This is one of the most crucial steps to ensuring a swift recovery. For the first day, stick to liquids and extremely soft foods such as milkshakes, smoothies, ice cream, yogurt, cottage cheese, and applesauce. While drinking all those liquids, be sure to avoid straws. Over the next few days, you should gradually integrate soft solid foods back into your diet. Coffee, alcohol, soda, hot beverages, and soda should all be avoided for several days after the surgery. Open your mouth: After the surgery, your jaws will feel stiff and strange, so you may not feel like opening your mouth. Making sure that you intentionally open your mouth often during the few days following the surgery is extremely important. Rinse with salt water: For the first few days after the surgery, you should rinse your mouth out with warm salt water after eating and drinking. This will help keep your mouth clean and prevent infection. Dissolve one teaspoon of salt into an eight-ounce glass of water. Gently swish some in your mouth, spit, and repeat until the solution is gone. Brush your teeth: You should brush your teeth the day of the surgery. You should brush extremely gently and avoid touching the area of the surgery. For the rest of your recovery time, you should brush the area where the teeth were, but extremely gently to avoid dislodging the blood clot that’s protecting the bone. Ice: To combat the swelling, you should apply ice. In twenty-minute intervals, apply ice to your cheeks and then remove it. You can use ice packs, Ziplocs full of ice cubes, bags of frozen peas, or even cut-up pantyhose to hold two bags in place over both sides. 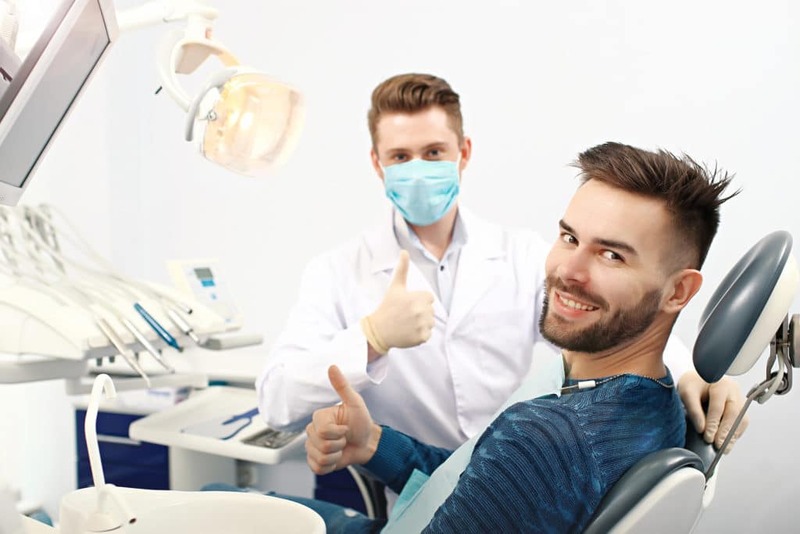 Listen to your oral surgeon: If your dentist or oral surgeon gives you instructions, it is because they want you to have a smooth recovery with no unnecessary pain. You should adhere to their guidelines to ensure the best possible process.